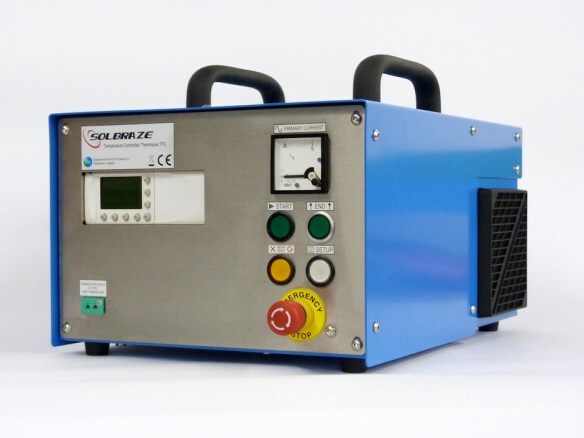 The Solbraze Temperature Controlled Thermopak TP2 is a revolutionary low voltage, high current power supply with a temperature feedback control system, based on our popular 1kVA TP2 Thermopak, giving repeatable solder joints time after time. This allows the user to produce consistent solder joints and avoids under or over heating the joint and causing thermal damage to surrounding temperature sensitive areas, materials, joints and components. Power output in each heating cycle phase can be varied from 0-100% and is controlled by programming, via the PLC, the required temperature of the assembly being soldered ensuring that the assembly has reached the correct temperature and that the solder has reached liquidus. A thermocouple reading the temperature of the components sends back information to the thyristor controlled Thermopak to give total control over the pre-heat, transition, reflow and cool down operations. As the thermocouple reads the components you can be sure of consistent soldering despite atmospheric or thermal changes to the components or tooling. The PLC controller allows you to programme the 0-100% power required to heat the assembly to the correct temperature application based on materials used, thermal mass of the materials and the temperature melting point of solder alloy needed to join the materials. 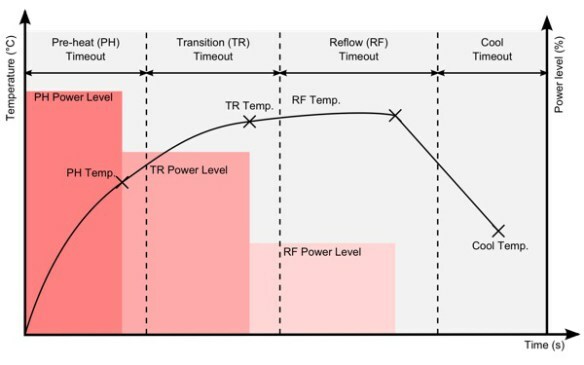 The heating cycle has 4 phases; Pre-heat (PR), Transition (TR), Reflow (RF) and Cool. All 4 have a settable temperature at which the cycle will switch into the next phase or, in the case of Cool, end the cycle. Heat Cycle Graph 1 illustrates the heating cycle. The temperature rises to the PH Temperature at the PH Power Level, the cycle then goes to the TR Temperature at the TR Power Level before switching to the RF Power Level until RF Timeout is reached and the power level is reduced to zero, finally the Cool Temperature (not shown on the graph) is reached and the cycle is ended. By default the voltage is set to 5.5 Volts but this can be altered by a simple link on the back of the unit to either 4.5 or 6.5 Volts should the application require different power profiles. Each phase also has a timeout which is set to ensure the equipment does not over heat. If the timeout is reached without the set temperature having been achieved the power output is set to zero and the cycle is aborted.